House paints are basically meant for providing both the decoration and the protection to surfaces of your house walls. A fresh paint job makes your house look pleasant and inviting. It gives a sense of completion; freshness and newness. The selection of paints and quality paint jobs carried out on your house walls are therefore very important tasks. The aesthetics of your house not only depends on the house paint and its colour, but also on the quality of painting work done. An expensive paint of good quality can produce disappointing results if not applied properly. Painting contractors sometimes in hurry or paint job done by unskilled labourers can ruin the aesthetics of your house. Hence it is important to check the quality of paint job to achieve not only value for money but also to enhance beauty and long life of the paint of your entire house. Here we have given few tips to check for a quality paint job. Also Read: Types of Paint Brushes for Different Painting Jobs! 01. First of all check the colour of your house paint. See that it is the same shade or tint you have chosen from the shade card (fan deck). See that the colour scheme has been strictly followed. 02. The paint on the walls should not drip. If signs of drips or dried drops are visible than inform the painter to sand it down and retouch it. If it dries then sagging defect may happen. 03. Check that all house paint is applied evenly and is free from runs and sags. See that the painted wall surface is smooth. Run your hand along the walls to check for imperfections. 04. Check if the original colours are covered properly with the new colour coat. 05. Check the edges of the walls and make sure these lines are straight and sharp. Uneven lines are signs of imperfections in workmanship of the painters. 06. Check whether caulking is done. Make sure that there is no leakage behind the trims because that may damage the wall surface. 07. The coverage of paint should be even, especially at the corners of windows and doors. 08. 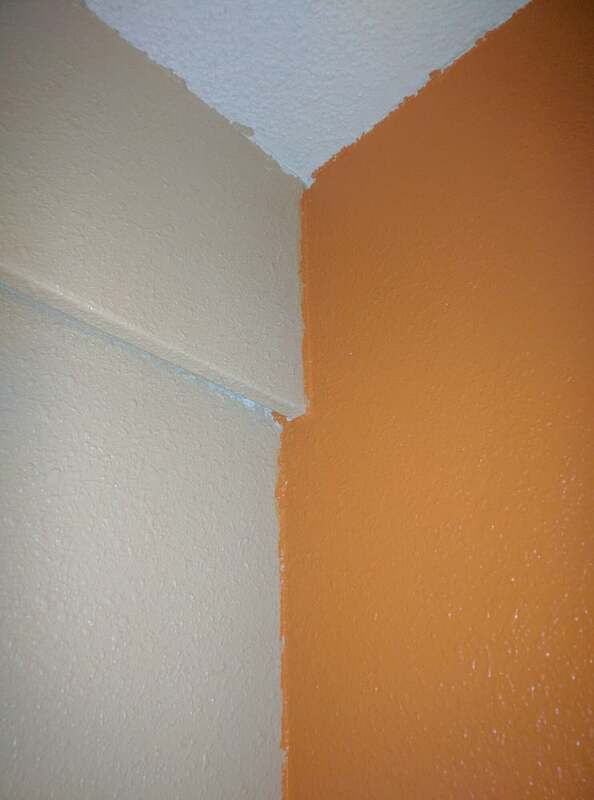 A good-quality paint job gives a clear-cut separation of colours. The lines between ceiling and trims, or the ceiling and walls should be clean, straight and sharp. 09. Check the paint at the corners of the doors, sidewall and also check the window corners. 10. The lines where ceiling and trim meet the walls should be clean and straight. You don’t want waves or wall colour creeping up on the ceiling. 11. Check whether all the painted surface has been repaired such as nail holes, cracks, peeling paint and other defects. 12. Check the paint near switch plates and outlet covers. 13. The brush marks and any other spots or patches should not be visible. If brush marks or spots are still visible than apply another coat of paint to hide those spots or patches. Also Read: How Brush Marks Effect Can Ruin Your House Paint! 14. Inspect the door and window frames and interior wardrobe walls because these are the places, which are often neglected or forgotten by painter. Similarly, see that no surfaces left unpainted like all four sides of window grills etc. 15. See that all stains of paint from floor, window glasses, grills, switch plates etc have been carefully removed. A homeowner should check the quality of painting work carefully both in daylight as well as in artificial light, so as to get the idea of aesthetics in both types of lightings. The aforementioned tips are to ensure a quality paint job. These tips will help you to evaluate the work of the painting contractors before you make the payment. It is important to monitor the work during its progress, as the entire quality of paint and its life will depend on the process.